Although gaining in popularity, the Quilotoa Loop is still a destination for travellers seeking adventure off the beaten track. 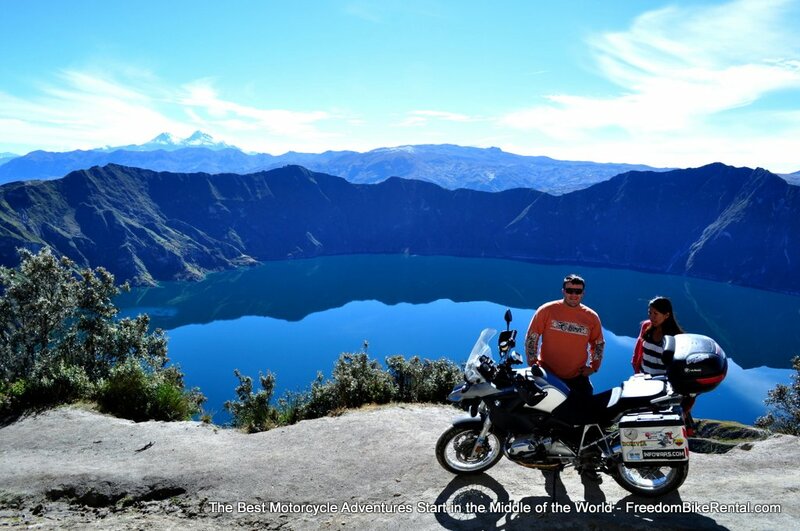 The Quilotoa Loop is one of Ecuador's most scenic routes. The route takes you through small indigenous villages, spectacular mountain views, lush valleys and across roaring rivers. 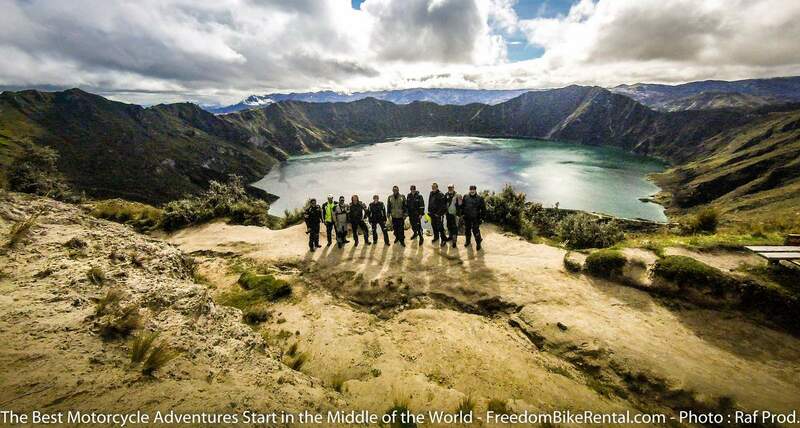 The route will bring you to the spectacular Quilotoa Crater Lake, indigenous markets and give you insight into how native Ecuadorians have lived for centuries. Route: 100% paved with options for 30% unpaved route if desired. 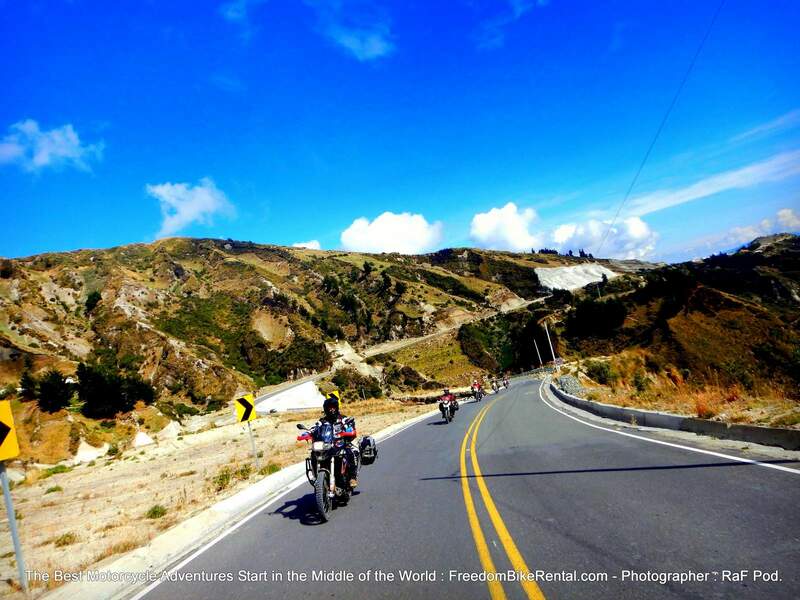 After a briefing and orientation to acquaint you with the customs and rules of the road in Ecuador, you will head out on the motorcycle of your choice that has a GPS navigation that has been pre-programmed with each day's route. You will be shown how to operate the GPS and given a Road Book with daily paper maps with guides to the points of interest along the way. Your hotel has been reserved and paid for in advance. 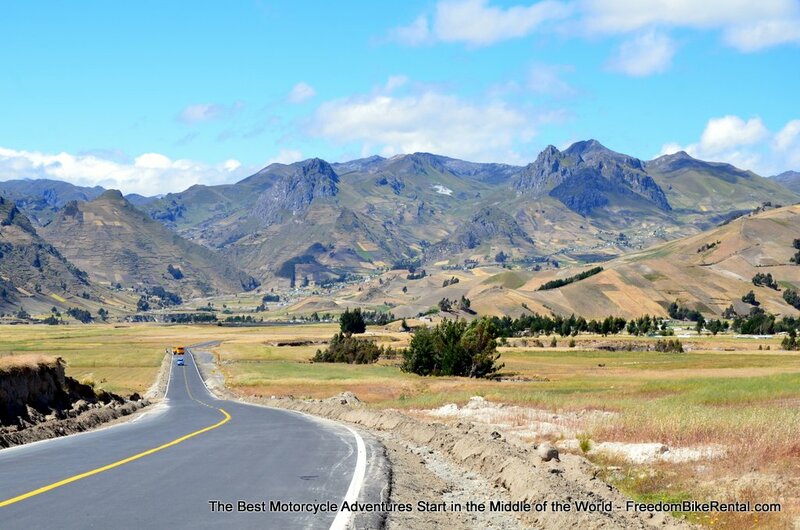 All you need to do now, is hop on the bike - and enjoy the ride - safe in the knowledge that you will see some of the best sights and the best roads in Ecuador! The GPS unit will indicate where you will take a right, onto a stretch of road known as the "Quilotoa Loop." This road will take you through many traditional Andean villages with friendly and helpful indigenous people and eventually to the Quilotoa Crater Lake. For now, you will be treated to some incredible roads, challenging (but fun) hairpin turns and majestic views. Here you can take an optional unpaved route to Sigchos - just select the option in the GPS and head into beautiful, more remote areas of the Quilotoa Loop! You will pass through the town of Sigchos, a colonial city founded by the Spanish in the 1500's in an indigenous settlement that was already centuries old. Sigchos has a beautiful church and a covered market in the center of town. Continue on newly paved road weaving past overlooks on the valley and canyons below and follw the twisty road to the friendly town of Chugchilan. Chugchilan is a firiendly Quechua town, known for its outstanding wood furniture workshops and the Andean cheeses in the center of town. You carefully chosen accomodations for the night are at the friendly Black Sheep Inn in the center of Chugchilan. Included is a dinner at the Inn - a great family style meal with pots and pots of food that will replenish you and help you get a good night's sleep in the chilly mountain air. After a hearty, filling breakfast, re-attach your GPS and start back on the Quilotoa Loop. The memories of the special morning air, sunlight, and the dogs (you'll see what we mean) here along with all of the busy activities of the people along this road will stay with you for a long time after this ride. You will soon arrive at the Quilotoa Crater lake, a water-filled caldera and the most western volcano in the Ecuadorian Andes. The 3 kilometres (2 mi) wide caldera was formed by the collapse of this dacite volcano following a catastrophic VEI-6 eruption about 800 years ago, which produced pyroclastic flows and lahars that reached the Pacific Ocean, and spread an airborne deposit of volcanic ash throughout the northern Andes. The caldera has since accumulated a 250 m (820 ft) deep crater lake, which has a greenish color as a result of dissolved minerals. Fumaroles are found on the lake floor and hot springs occur on the eastern flank of the volcano. After the lake, you'll ride into the Indigenous town of Zumbahua - a friendly, picturesque town with a great indigenous market on Saturday mornings. It is also a great place to have lunch or a snack from the makret vendors in the center of town with home made empanadas or hot dogs with french fries (salchipapas). After Zumbahua you will climb into the small Andean town of Tigua, which is famous for its school of art and its art gallery. A great place to stop and take a look at the great art made in this region. You'll climb again into the chilly air of the highlands pampa and overlook the valley below. You will want to have an extra layer of clothes ready. Then you will twist and curve down into the city of Pujili. The Pujili Market takes place at Pujili every Sunday. People from surrounding villages and towns gather at the indigenous market to sell a wonderful variety of traditional trades and crafts in order to make a meager living for their families. The variety of goods here is often more beautiful and carefully crafted than those found in more easy-to-reach places where stock goes quicker and the emphasis on quality and beauty is not as important. Then you'll head north on back roads to the town of Saquisili, with a huge market every Thursday. Then you will rejoin the Avenue of Volcanoes in the city of Latacunga. If you’re hungry, ask for a plate of chugchucara at one of the roadside restaurants. 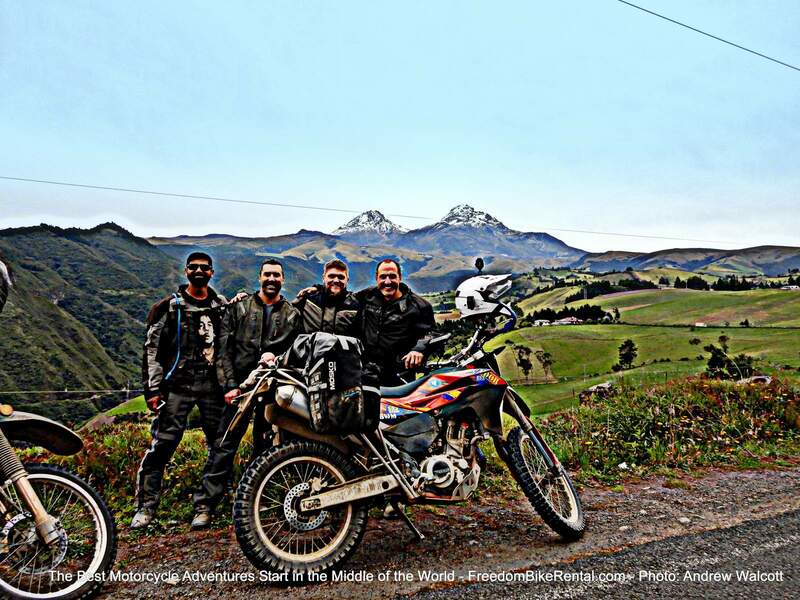 Riding back to Quito you'll have the Cotopaxi and Illiniza mountains towering above you as you return to Quito, having experienced one of Ecuador's most scenic routes. This self-guided adventure will start and end in our offices located in the Carolina neighborhood of Quito. Prior to your departure you will be provided a detailed and thoughtful presentation on Ecuadorian rules of the road, customs and courtesies. You'll be instructed on how to operate your pre-programmed GPS navigation unit and given a packet that includes your prepaid hotel voucher, daily map sheets that include genuine points of interest, descriptions of local highlights, and "hidden gems" that aren't common knowlege. You can use this information to tailor your days - including as much or as little as you like. The route will be reviewed with you in detail to provide you with additional useful information about timing, suggestions for lunch stops and where to get gas along the way. 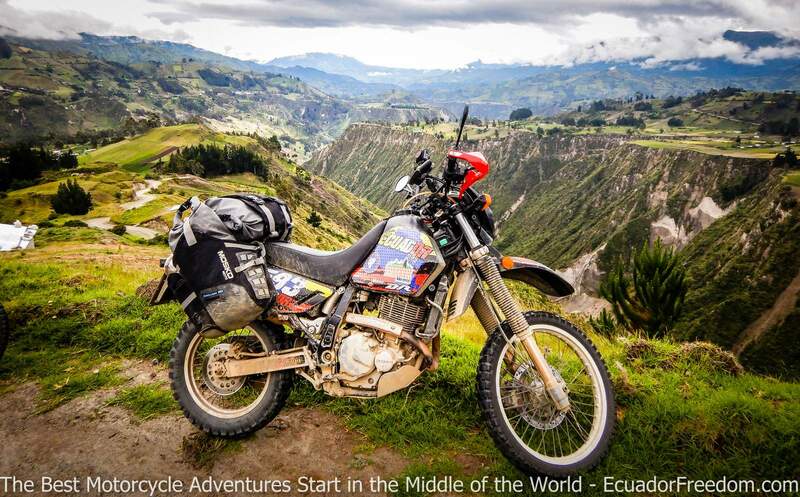 On the morning of your departure, you will be provided the adventure motorcycle (or 4x4) of your choice which is fitted with waterproof luggage system, a first aid kit, a tankbag (if you want one), spare innertubes (or tire repair kit) and a set of tools. In addition you will have a prepaid cell phone to call us for support at anytime during your trip. We will carefully review the bike or 44 using our mult-point checklist with you to be sure that everything is in perfect working order before your departure and that you know what to do in case of an emergency or breakdown. The route you will follow over the next two days is based on several years' of experience and riding these routes many times on our various guided tours. The route to get out of the city of Quito, taking a tunnel just a few blocks from our office that will put you on a highway to the south of the cityl There is very little city driving involved. The route is primarily on paved back roads with very little traffic. There are several stops available which are marked on the GPS unit and the daily route sheets. 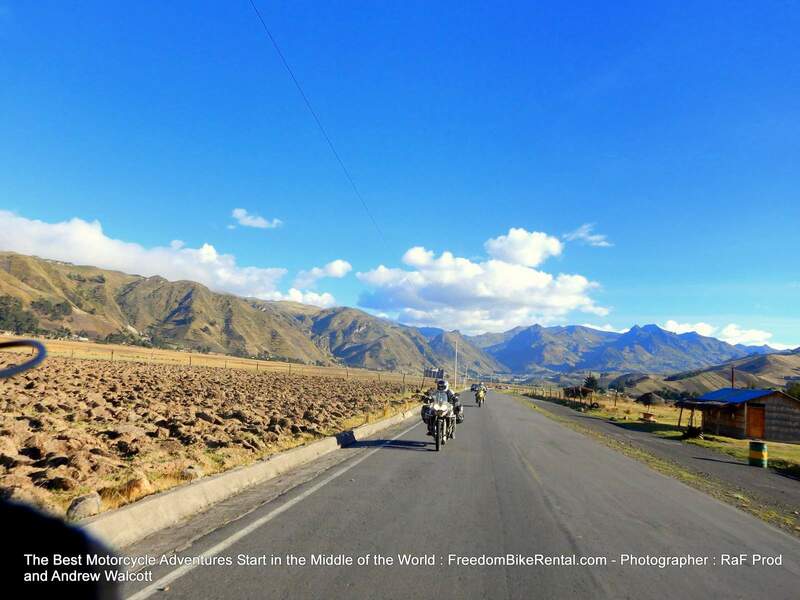 If requested, Ecuador Freedom will be happy to provide you with a route with unpaved, unimproved dirt roads. Weather and temperature ranges in Ecuador are generally the same year round. In the highlands, you can expect the chance of passing showers but rarely a full day of rain. Chances for a full day of rain are more likely on the western slopes of the Andes in March, April and early May. This ride will be in elevations of about 8,000 feet (where temperatures can be around 60-80 degrees fahrenheit) to 13,500 feet (where temperatures can be around 35-60 degrees fahrenheit). Dressing in layers is recommended. Plesse see this article for more nformation about the weather in Ecuador. There is one overnight stay included in carefully selected, ideally-located, non-touristy, comfortable accommodations. See this page for details, photos and links to the accommodations provided. Ecuador Freedom has the right to substitute accommodations of equal quality due to availability and will notify you of these changes.